Instalart, a cultural association with the goal of promoting and support three-dimensional arts (sculpture, object and land art) invites you to the launch of the project Instalart/ Obiect/ 001- Inspired by Peroni. Seven of the great Romanain object designers will be presented with their works. 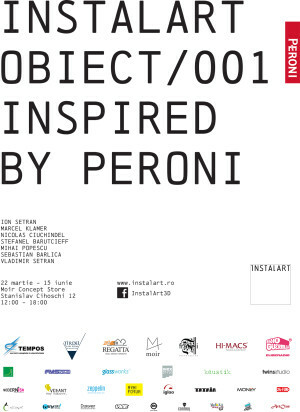 Instalart/ Obiect/ 001- Inspired by Peroni presents the designers above, their activity and the objects proposed for the project. The exhibition will be available until beginning of June, when their proposals for the project will be shown to the public. The theme is Italy from the 60s and the objects are made by Instalart with the help of its sponsors and partners. "Instalart/ Obiect/ 001" Art Show in Bucharest. You can get here description, reviews, address, time and details of "Instalart/ Obiect/ 001" Art Show in Bucharest. Visit Bucharest Tips for more Art Show events in Bucharest!